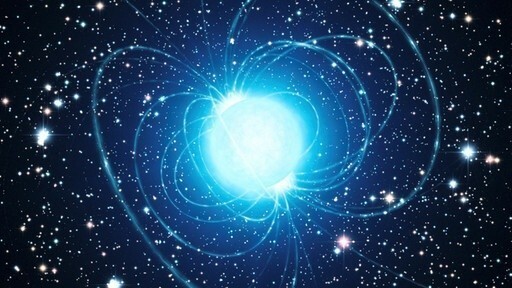 A magnetar is a neutron star with an extremely strong magnetic field, a billion times stronger than the strongest fields we can create on Earth. As a neutron star, magnetars also have very strong gravitational fields, with a surface gravity a hundred billion times that of Earth. Such a high gravity would seem to ensure that a magnetar is spherical, but a magnetar’s strong gravitational field could distort the star, making it more of an oblate spheroid. We’ve suspected that such a magnetic distortion could occur with magnetars, but now a research team seems to have found an example of this phenomenon. The result was published in Physical Review Letters, and analyzes data from a magnetar known as 4u 0142+61, which is also a pulsar. As you might remember, pulsars are neutron stars that emit strong energy pulses in our direction as they rotate. Because these pulses are of very short duration, we can make very accurate measurements of their timing. This allows us to measure the rotation of a pulsar with great precision. The measurement is so precise that we can observe their how rotational periods gradually lengthen as the neutron star loses rotational energy. We can even observe small glitches in their rotation due to starquakes. The precession of the magnetar due to its oblate shape. Credit: K. Makishima, et al. Normally the rotational period of a pulsar will gradually lengthen, with the occasional glitch that causes a sudden shortening of its period, only to continue its gradual lengthening. But in the case of 4u 0142+6, the authors discovered something rather odd. They measured the pulses of x-rays from the magnetar, and found that sometimes the pulses arrived a bit earlier than expected, and at other times a bit later. It appeared that the rotational period had a slight oscillation to it. This shouldn’t be possible for a spherical neutron star, but it is possible for an oblate neutron star. That’s because an oblate spheroid precesses as it rotates. Precession is the effect you see with a spinning top, where it wobbles as it spins on its axis. We see the effect with the Earth because it is an oblate spheroid, which is why the north star of today is not the same as the north star thousands of years ago. The magnetar 4u 0142+6 seems to wobble in a similar way, which is why its pulses are sometimes sooner or later than expected. For the Earth, the precessional period is about 26,000 years. For 4u 0142+6, it is about 15 hours. This means the magnetar differs from a sphere by about 1 part in 5000. When the authors calculated the magnetic field strength necessary for such a deviation, they found that it was about a trillion tesla. That is higher than most magnetars, but within a reasonable range. So it seems that this particular magnetar is indeed warped by its own magnetic field, which gives it is weeble wobble motion. Paper: K. Makishima, et al. Possible Evidence for Free Precession of a Strongly Magnetized Neutron Star in the Magnetar 4U 0142+61. Phys. Rev. Lett. 112, 171102 (2014).